Ideacodes is pleased to launch our first release of Twitterverse, a mashup and a visualization layer that mines and archives the public timeline of Twitter and provides a visualization of the most commonly used words in a given time period. Twitter, the hot new product by Obvious, is a “sophisticated, device-agnostic, social message routing system that nobody realizes they need until they try it,” as Biz Stone so aptly described. Twitter has rightly taken the web and blog communities by storm in the last month. We launched our first release of Twitterverse tonight after working on the idea for the last couple of weeks and then the last 48 hours straight. We’re self-proclaimed Twitter addicts. It’s given us a glimpse into the lives of so many and let us share those moments in time, both mundane and magnificent, that otherwise would have gone unnoticed. Where blogging gave us a similar connection to the thoughts of individuals worldwide, Twitter is capturing these little moments in time – much like a photograph momentarily stops and captures time visually. This power to make the invisible, visible, is something that’s always intrigued us regardless of the medium. These moments show us that our thoughts and actions are interwoven and unique, and that our desire to stay within each other’s attention periphery is what makes us human. The 140 character format of Twitter also lends itself to a specific style of prose or poetry that readily displays one’s personality. As soon as we got on Twitter, our first thought was, “what’s everybody on Twitter doing?” We wanted to see a visualization that showed text/content overlaps and popular words used by people over any timeframe. In the spirit of Hackers and Painters, we threw together a mashup to show this view into the content. 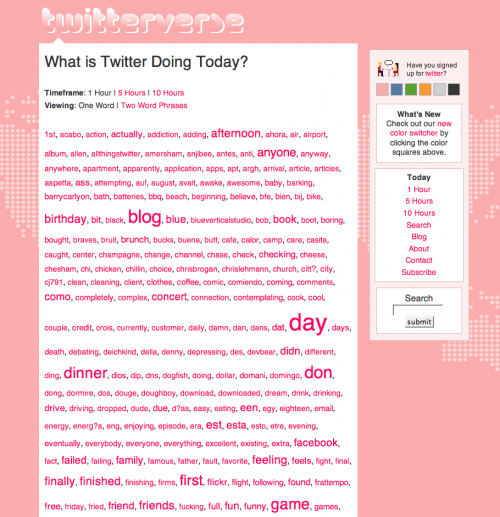 In its current form, Twitterverse displays popular words based on time and popularity. We’re pulling data every minute from the public timeline RSS feed as it updates. The data is parsed by word match, eliminating certain types of words, and a script generates the cloud based on time frame and popularity. We’ll be adjusting the algorithm frequently as we get more data, as well as limiting out certain words (or display names). For now, words are displayed based on being repeated a certain number of times during the specified timeframe. Even at this basic level, you can start to get a sense of our collective activity and the general zeitgeist of the day. For example, since we cleared our test data and started re-collecting data off the public timeline on Sunday, April 8 at 5:40pm PST, we started to see a shift from people twittering about “easter” early in the day to a growing number of people twittering about “sopranos” as the night progressed. You can imagine checking in daily to see what topics arise. Keep up to date by visiting the Twitterverse blog and subscribing to the Twitterverse RSS feed. We hope you enjoy Twitterverse. Let us know what you think. The name, Twitterverse, is a play on both our focus on the content and verse being created on Twitter, as well as the community and cosmos that makes up the Twitter[uni]verse. If you’re a developer or a server expert and would like to help out and get involved, please get in touch. We’d like to send out a special thanks to Andrew Weaver and Ver Pangonilo for their great scripts. Twitterverse is the first project by Ideacodes Labs, a new experimental component of our web consultancy. Holy Pink Mashups Batman! by Biz Stone at the Twitter blog. Twitterverse in the Blogosphere: a round up of blogs talking about Twitterverse. For ongoing news, check the Twitterverse blog. We’ll definitely play around with it. Thanks, Emily! Cool hack. I like the idea of extracting popular keywords from people’s twits. The list of terms is a little overwhelming now. Have you thought about using the Yahoo! keyword extraction API? Rather than spitting out a list of every random keyword, it will selectively identify meaningful words and phrases. Might result in more useful list of terms for your tag cloud. Fewer keywords, but higher quality. I’m developing twifter, http://twitter.caboo.se – which shows you the intersection of multiple friends, so you can add anyone you may have missed, or discover mutual acquaintances. Lots of interesting applications for this. The message size limit and the fact that they are “first person” helps narrow down what you need to do. Hackalicious – now how can I incorporate this with my business, http://www.shoplauralees.com/default.asp ? Finally got around to taking a look. This is the first Twitter mashup that’s had more than a fleeting appeal for me. I have been sitting on the fence regarding whether Twitter is really revolutionary, and now I’m starting to see it. Seems very fresh and real..Great! And that real time geographic visualization of http://twittervision.com is addicting to watch!